It has been almost a decade since the Deepwater Horizon Oil spill. Described as the worst environmental disaster in the United States, nearly 5 million barrels of crude oil oozed into the Gulf of Mexico, severely degrading the marine ecosystem immediately surrounding the spill site and directly impacting coastal habitats along 1,773 kilometers of shoreline. About 10 million gallons remain in the sediment at the bottom of the Gulf and may continue to cause severe physiological damages to marine life, including impairment of sensory systems. Marine fishes rely on the effective functioning of their sensory systems to survive. Despite the obvious importance of their olfactory (sense of smell) system, the impact of crude oil exposure on sensory function remains largely unexplored. 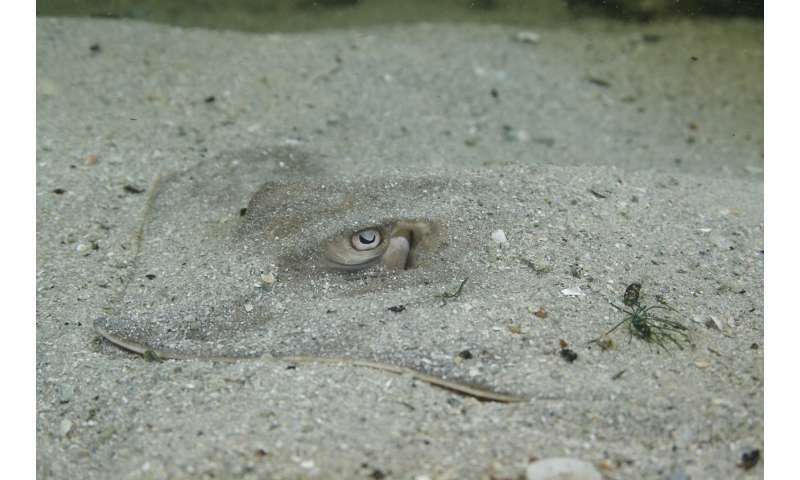 Researchers at Florida Atlantic University are the first to quantify the physiological effects of whole crude oil on the olfactory function of a marine vertebrate—the Atlantic stingray, Hypanus sabinus, an elasmobranch fish. Results of the study, published in Scientific Reports, confirm that exposure to crude oil, at concentrations mimicking those measured in coastal areas following the Deepwater Horizon oil spill, significantly impaired olfactory function in the Atlantic stingray after just 48 hours of exposure. These findings suggest that exposure to crude oil could detrimentally impact fitness, lead to premature death, and cause additional cascading effects through lower trophic levels. 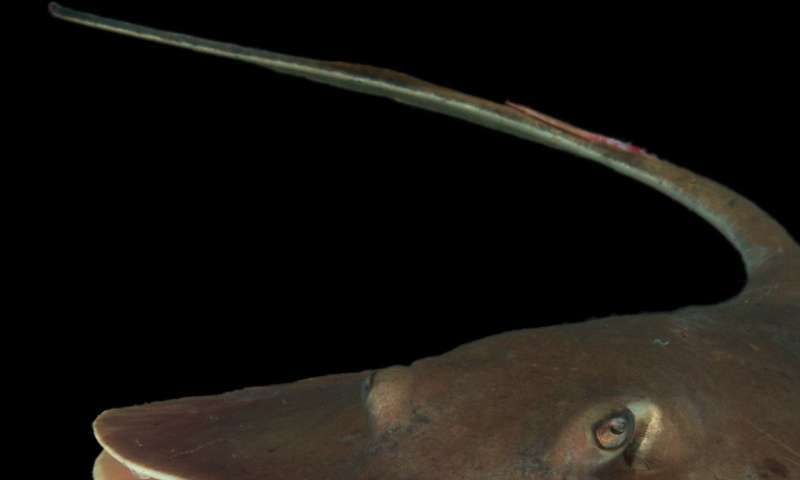 "Elasmobranchs are renowned for their well-developed sensory systems, which are critical to alert them of the presence of predators, prey, mates, and unfavorable environmental conditions. Any impairment of these sensory systems could have a damaging effect on their survival and fitness," said Stephen M. Kajiura, Ph.D., co- author, a professor of biological sciences in FAU's Charles E. Schmidt College of Science and director of the Elasmobranch Research Laboratory at FAU. The work was conducted by Eloise J. Cave, as part of her master's degree in Kajiura's lab. Cave, who is now a Ph.D. student at the Florida Institute of Technology, employed an electro-physiological assay to test olfactory responses from stingrays held under clean water and oil-treated water. She found the oil exposed animals exhibited a smaller response, with a slower onset and longer duration. "Unlike other sensory systems in which the receptor cells are not in immediate contact with the environment such as the eye, inner ear, lateral line, and electroreceptors, the chemo-sensory cells of the olfactory organ are directly exposed, through the mucus, to the seawater," said Kajiura. "As a result, environmental pollutants have the ability to directly damage the receptor cells and affect olfactory function." Although this study focused on a shallow water, coastal species, deep-water elasmobranch species may be highly susceptible to crude oil exposure. 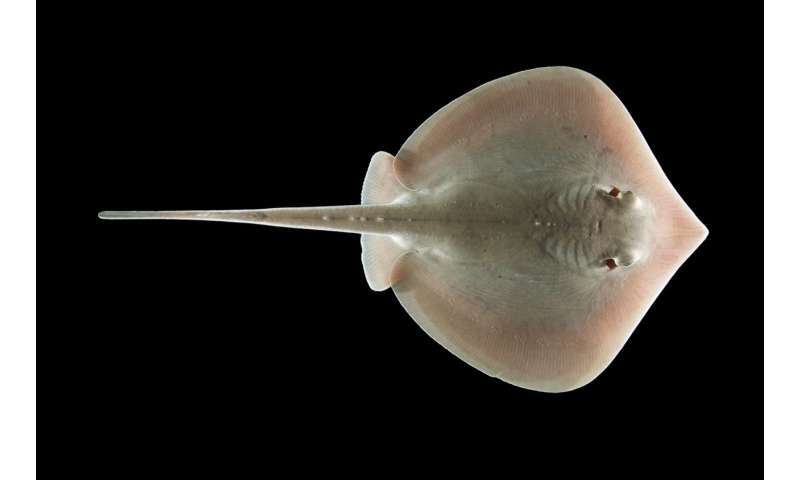 The researchers caution that deep-sea benthic species like skates—a type of cartilaginous fish that develop for prolonged periods in egg cases on the seafloor—in particular, could be continuously exposed to high concentrations of crude oil in the sediment throughout sensitive developmental periods. Also, because the metabolic rate of marine organisms declines significantly with temperature, and hence depth, deep-sea elasmobranch species have a much slower metabolic rate than shallow water species and therefore might metabolize crude oil much more slowly. This prolonged exposure could manifest as different or more severe results. "Under field conditions, animals are likely to encounter variable exposure concentrations, which may be higher or lower than the concentration used in our study," said Kajiura. "This acute exposure has the potential to induce other physiological responses, potentially compounding the adverse effects of the altered olfactory function. Even if the oil does not cause immediate or direct death, sub-lethal effects could still reduce fitness or contribute to premature death." Crude oil contains many complex organic and inorganic compounds including heavy metals such as aluminum, manganese, cobalt, copper, zinc, and mercury. Heavy metals can block sodium and calcium ion channels in the olfactory systems of teleosts—a diverse group of ray-finned fishes—resulting in reduced olfactory responses. In addition, water-soluble fractions of crude oil have caused hyperplasia, necrosis, and lesions on the olfactory epithelium. All of these physical insults may result in reduced olfactory sensitivity to chemical stimuli.